We just released Elementor Pro 2.0, the most advanced page builder ever created, with built-in theme builder capabilities. Design your entire site in a new visual way that is light years ahead. Some parts of the theme simply couldn’t be touched. You had to use code and a lot of guesswork to change different areas of your theme. Using Elementor, you were restricted to the content area of your website. Until now, you could only create static content, not dynamic content. Unlike landing pages, the dynamic parts of your site (like blog posts or product pages) required dynamic content, and couldn’t be handled without code. With Elementor Pro 2.0, we addressed both issues, making it possible to design every part of the website dynamically, visually, and with zero code required. With this release, you can finally visually customize your website headers, footers, archive pages, single post pages and other areas of your site. This not only saves you time, but introduces a whole new drag and drop experience to building WordPress websites. We believe the new theme builder capabilities will change how people create and edit websites. We worked months developing the most streamlined, simple process for editing every area of your site. WordPress users on all levels will be able to quickly learn to use and incorporate the new features in their workflow. Template Type – Choose the type of template you want to create. This can be header, footer, single post page or archive page. Let’s explore each of these parts in more detail. 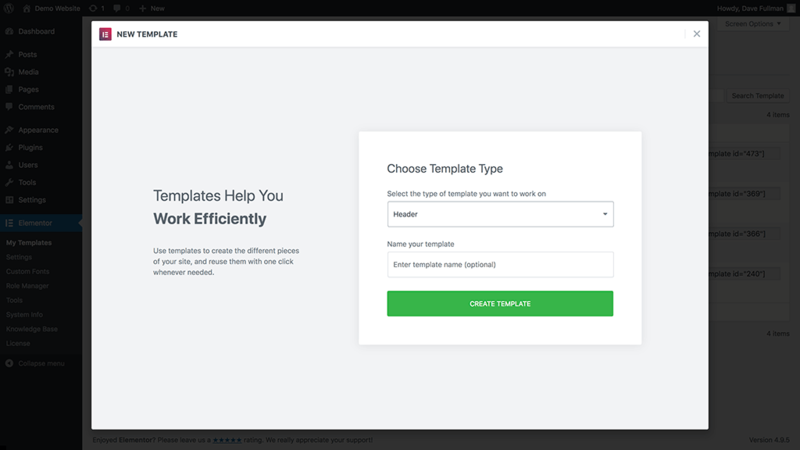 With Elementor Pro 2.0, you need to start thinking of templates as design units, capable of customizing each and every area of your site (including your blog, footer and so on). Until now, you were limited to a specific area in your website: the content that resides between the header and the footer. This is a restriction of all page builders, leaving other parts of the website to be coded on the theme level. Now, we are introducing several new templates. All the left-out parts that used to be handled solely on the theme level, can now be visually designed in Elementor. These templates are seamlessly integrated into place. Created a new header template? Elementor recognizes it as a header template and can use it as a header in your website without any need for coding. The same goes for single post templates. You create the single post template, and Elementor knows how to implement it on any or all of your single posts. Archive pages are created in the same manner. You create an archive template, then implement it on your posts archive or your products archive, search results and so on. It all starts with creating a new template. 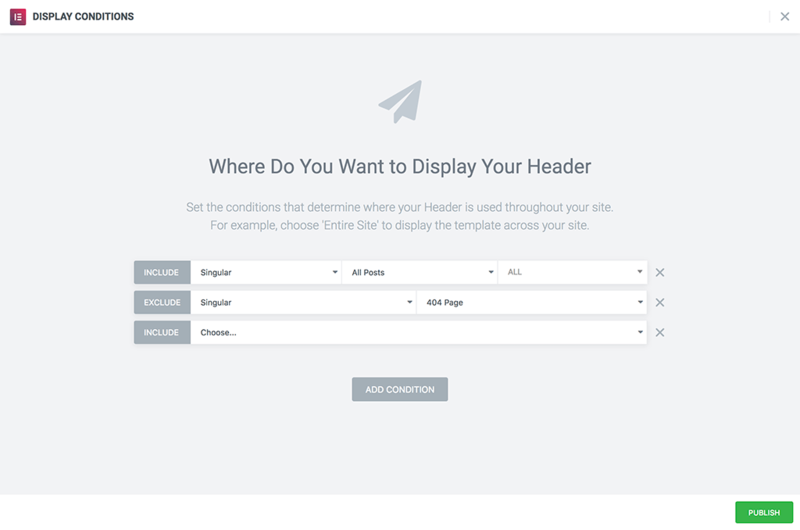 By using these new templates, you gain control over other areas of your website, with no need to code anything. If you’ve ever struggled with header.php and other types of files, you can start to grasp how this is going to simplify WordPress web design. Build the Framework Once. The Content Is Added Dynamically. After choosing the type of template you want to create, it’s now time to fill it with dynamic content. Until now, page templates included static content only. You created a page and then published it. Elementor Pro 2.0 allows you, for the first time, to create a template with dynamic content. You create the design framework of the page, including dynamic parts like page title or featured image, and the content is put in automatically. For headers, you can build the entire menu from scratch, maybe add a search form, add another top bar. You can embed your site’s logo, and if you ever change that logo on the site level the header will automatically be updated on all pages. For single posts, you can embed elements like the page title, featured image, the content and every part of the blog post. Then, if you create a new blog post, the design of the page will automatically be inherited from that template. For archive page, you can build the template of your blog, and customize it without touching any code, all inside the Elementor editor. This feature can be used to customize any type of dynamic content or custom post type, including advanced content you create with ACF. When you create dynamic content, especially for single post and archive pages, it’s sometimes difficult to imagine the end result. For this reason, we added the option to preview the result with any previously made content. If, for example, you create a single post, you can see how the final result will look like by previewing the single post with any of your previously published posts. This way, you can work on the design while seeing what the actual result will look like. You can also try different previews and switch between posts, to make sure you like the result across several posts. Once you finish creating your dynamic content, it’s time to choose the conditions that the content will be applied to. Apply your template across your entire site, for a certain category, certain page or any other condition you want. Each template includes display conditions that determine exactly where the template is implemented. For example, if you create a header template and want to display it ONLY as the header of your single posts, you can do it easily by choosing single posts from the drop down menu. One of the truly great things about Elementor Pro 2.0 is that it works with any WordPress theme. This gives you, as a WordPress user, maximum flexibility and freedom to work with your favorite theme, or switch themes and not have to worry about making changes. If you are a theme developer, you should use our detailed documentation regarding how to register a new location and manually integrate to our Locations API. 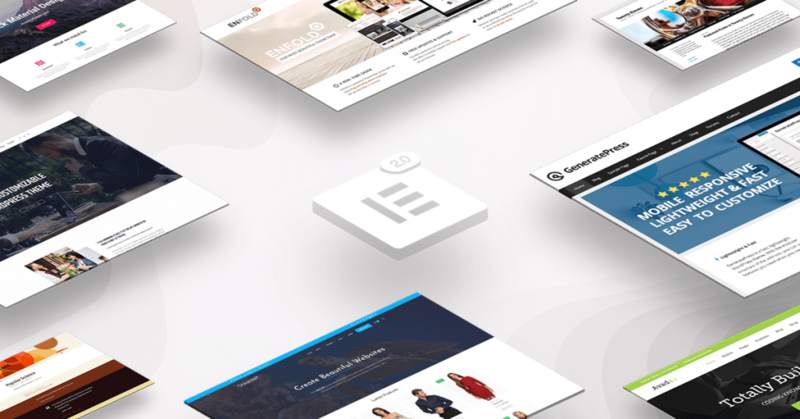 Elementor Pro 2.0 introduces a new way to build and customize websites. You finally get total control over every part of your WordPress site. In the following months, we will be working hard on expanding the capabilities of Elementor 2.0 further, including a complete WooCommerce solution, ACF and Toolset. If you’re already Pro users, update and download Elementor Pro 2.0 from your dashboard. Please make sure that you read this guideline before updating Elementor. Get the best drag and drop WordPress theme builder. Join Pro today! Congratulations to the whole Elementor-Team! Wow, this is amazing. Keep up the great job guys! You guys rock, the only thing i missed from beaver! Once again, Team Elementor has taken not only the pagebuilder to a whole new level, but how designs and content is published, whether at the page level or site wide. TOTAL game changer, and well worth the wait!! A game changer! Awesome work. GO E! Massive accomplishment, well done! Will there be a beta test for the woocommerce features? very nice! I’m love it! I waited for it because I want to build my new website with this nice tool. Not able to set Post’s Featured image as a section background. Let’s get the party started! Thanks for the amazing work you guys have done here! I use the Elementor pro, is amazing !!! Congrats guys! Elementor Pro 2 is just awesome! It has been a breeze to add theme support for it and register custom locations. Keep up the great work! Wonderful! Thank you for your hard work and congratulations on this huge milestone. I T F E E L S L I K E I T ‘ S M Y B I R T H D A Y ! ! ! “including a complete WooCommerce solution, ACF and Toolset.” – YES! Super-stoked with the release, and looking forward to the ACF integration! For those also interested in a Pods integration, here’s the official request that I’ve created on Elementor’s GitHub. Please add your voice to it to support the request. Thanks a bloody lot for all the awesome work you guys put into this. Elementor, which I’ve only discovered a few months back, has completely changed my workflow. Elementor, could you recommend the most stripped back, code light theme – without all the bells and whistles? Now that you seem to have taken away a lot of what is required of a theme to run with elementor and elementor pro, I don’t think we need fancy code heavy themes dragging down site speeds. I’m really looking forward to using Elementor’s Theme Builder functions! Hello theme is great and a child theme would be help as I have concerns about updates deleting changes and additions I have made. Awesome work. What about Pods integration? This is what I’m waiting for months!!! Thank you elementor! Now I’ll never look back! I’ll use elementor forever! This time using the term “game changer” is not an exaggeration. Awesome! Was just about to ask about that! Wow! well done guys this changes everything for WordPress design and endless possibilities when using dynamic content with ACF! Thanks guys for all your hard work – this is setting the bar very high!! I’m working with the beta and it’s amazing. “including a complete WooCommerce solution, ACF and Toolset.” – Already a game changer but these will be the ultimate! I really love Elementor, I upgraded to Pro. So a big fan, makes life so much easier. Nooooooooo…..just today I have spent hours fidgeting with manually coding custom archive, post and other page templates for an old theme…with this I would have done it in a blast……absolute fantastic..! Wow. I’m speechless. I’m impressed. Joining the request and the compliments (job well done) … Woocommerce design is essential…. This is fantastic! totally awesome team! Wow, you released two great features within the last 2 weeks. Is it magic? Thank you! so does this mean i dont need to use Generate Press or any such theme? Great keep it up guys..
Wao! Super stoked. This is indeed a game changer. One thing is missed in this release. Performance. And how do you exactly integrate output from ACF Field? Or any other custom field attached to post? Ok, found It 🙂 There is no dedicated element, but text element can be custom field 😉 Nice…. So does this mean that you don’t need a theme? If not, what would be the best theme to use? What’s going to happen when WordPress 5 (and Gutenberg) arrive? Isn’t there a risk that this tools won’t work anymore? Ohh my God !! this is incredible !!! A BIG step for refining “Building WordPress Websites”. Elementor TWO can stop the hazzles with additional plugins, writing php code and using blogs, archive and category pages more efficiently and a modern up-2-date design! Love it!! Any idea on then we can make our own archive loops? Like blog blocks with custom fields etc? The Elementor team is working over time with all of these new features!. The ‘Dynamic Content’ option is missing for me even after update. Do I have to pay for Elementor Pro again to get this update? Great job, thank you so much! Is sticky header option integrated? Really a Game Changing Feature Update. I will definitely try this out while building my next landing page. Nice work! Hey Ben, one thing I’m hoping to see with headers and nav menus in the header – is there a way in Elementor Pro to make a sticky menu? Also I’m looking for a “Back To Top” button – am I missing that? Nice job! I’m looking forward to site rebuilds now. Wow I can’t wait to test this, nice work! Congratulations to the whole team and good luck & good designing to all Users. Does it work with WooCommerce? Can I do a single product of WooCommerce? Thanks. Is there anything I should be worried about when upgrading from 1,9.X to 2.X? Any breaking changes? Elementor Pro 2.0, the most advanced page builder ever created, with built-in theme builder capabilities. Design your entire site in a new visual way that is light years ahead…Awesome truely awesome….. This is amazing work team. Keep it up! Fantastic update team. Elementor was already my first choice for building any WordPress site and this have made that even more compelling. Seriously this is amazing. Nice work. My company started using Elementor Pro about 3 months ago and LOVE it! These updates are very exciting! So does this pretty much replace the AnyWhere Elementor Pro plug-in? Great job as always. As the innovators you are just thought I’d ask about a couple of very ‘standard’ WP features and if they are on the pipeline at all. 2 – Related Posts. Much more useful than Post nav before | after. With thumbnail ideally. I agree with ‘Related Posts’, they’re are a must for directory sites. Wonderful work guys. Thank you. Any chance of an integration with WordPress Pods Plugin? Or maybe being able to grab current logged in user data to display? Come on, Robin, to the Bat Cave! We have to start using Elementor 2.0! What happens if you want to change the background of the header for instance? Do you need to update the header on every page? Or only in the template? Hey Arvid – nope, just go to Elementor > My Templates and edit your header using elementor and save. Boom all instances are updated wherever you asked the header to display (entire site if chosen to display on entire site). You have to enter and re-enter the background everywhere you want it to appear. There is no “global” background setting, for example. Which I think is an oversight, and I hope they will rectify soon. We shall see. Will you add ACF Repeater Field support? Properly stoked about this! Installed on test domain this morning. *cracks knuckles, rolls up sleeves* – Let the joy commence! Amazing job guys, and waiting for further enhancements such as sticky menu. What a great news that I’ve been waiting for!! woohoo! elementor has moved from a “page builder” to really a theme builder! thank you so much! There is still something very important missing. Would be perfect if one could generate a template in the library and reuse this template throughout the website. Those reused templates should only obtain the styling like paddings, margins font setting etc but not the content! If one changes the setting in the library all reused template should be affected by that change but content like text stays individual! That is still missing:-( Unfortunately the global widget function is not capable of having individual texts for each instance…. Can’t wait for the WooCommerce integration! Speechless. You’ll take my money very soon. I love all the changes you have made but I would love if the information could be in Spanish too because i feel I am missing a lot because is only in English. There are just 2 things now that I think would elevate this to an even more mind-blowing solution. Thing 1: A more sophisticated solution to colour schemes and colour theming. think instead of having the picker with presets the picker should be showing the colors from my current chosen color theme and a global change to ‘color 4’ in the theme should apply sitewide, or if you want just switch out the whole color theme, or allow different color themes to be applied on a per template basis. What will be the main focus from now? WooCommerce or ACF/Toolset? A selfish wish is the Toolset integration, because I need it badly and its still in beta. Can you elaborate a little bit on when this will get priority in the coming months? I currently have a template for my header, footer and contact info, that I reuse as needed. That way I’m only changing the information once and it updates site-wide. Maybe just add a post widget with a few posts from the same category or tag in your blog post page template? Thanks – Great update! But I can’t see how to create a template for a specific custom post type? Is it possible, or will it be possible in a future release? Can the finished theme be exported as a stand-alone theme? How? Is there a way to create a single and archive template for a specific custom post type? Well it seems you guys just did something to win me over from Divi. I’m really going to dive into Elementor again and see if it works for my web design. Is there any way to get a list of custom posts, and that can be filtered by taxonomies/terms or custom fields? Great job with the update! I love Elementor. I also see on the latest update you can now make a section ‘sticky’ for all those wanting a sticky header/menu 🙂 Just ensure you go to the advanced tab of the section and select ‘Scrolling Effect’. I hope to see more new things added in that section. This is incredible. Thanks for the update. Can’t wait to play with the new features! Best 2k18 page builder by far ! You owned the competition, great work !! This is fantastic. I feel like it’s giving more power back to designers in a way. At the moment I miss GLOBAL extended font customisations (letter spacing for H1, H2 etc.) and coloring for the same the most in Elementor. Congratulations. That is a great news. Thanks, and great job Team Elementor!!! Simply brilliant. Fantastic development. Designing new websites and templates already. Does it work with custom post types and pods? I.e. can I deactivate AnywhereElementor now? So glad I upgraded to unlimited Elementor Pro now. That’s great, really. Because I’ve had a problem of reducing the size of the header and I’ve had to try out many othe templates for the replacement which it didn’t succeed in the end and I was forced to stick with the same template having an over-sized header which is frustrating. I guess, now I can change that, can’t I? Great tools! However, the title ‘Theme Builder’ of this post is – IMO – a bit misleading, this is the feature I really want: design a site and output it as a theme that can be content-edited but not design-edited by the client. okay great but is there a free version to try and how do I guet it? will the free version get the theme builder functionality? Will Elementor Theme Builder support PODS in the near future. I have build my site using Beaver Themer + PODS Themer add-on to create dynamic content where I could have slider image on my property (real estate) landing page. The problem is that I hated Beaver Builder because it is so difficult to style the page. They are not that intuitive when compared to Elementor. I really hope that you guys will support PODS soon. I really like Elementor. I have it on another website. THank you. I’ve purchased Elementor Pro lately and I’m very excited about it. The only problem I am facing, is the connection with WooCommerce. Basic integrations are possible, but when I want to fully build the shop overview page Elementor and the product detail page, WooCommerce keeps overwriting and I am not able to do any edits. When I try to edit the shop page, or when I try to set an inner style with StylePress, I’m like lost. When I just try to edit the shop page, Elementor is telling me: “Sorry, the content area was not found in your page.”. When I try to override the single product page with StylePress, the settings are saved but it just doesn’t work. I hope anyone has a solution to my problem. Ps. I haven’t tried AnywhereElement yet, but I just don’t like it to use ANOTHER payed plugin for my purposes. lupetalo, are you able to display a featured image from a relationship field? i.e. If I use a relationship field on one custom type for choosing another custom post, can I dynamically display that related post’s featured image? Light years measure distance, not time. I hate that. Are there any possible conflicts anticipated with Gutenberg? Holy cow this is amazing! With this and header/footer builder, I can’t see a reason to use anything else. Now I’m waiting on the details of this “complete WooCommerce solution”. I hope that’s dropping soon, because I have 3 sites I would LOVE to get off Shopify and BigCommerce. If you can get me away from their crazy fees ($30/mo for a visual page builder?!?! ), I will love you forever. I have a question regarding the Elementor page builder. Whenever I use “Edit wtih Elementor” and save the new page design, but when clicked on “Back to WordPress Editor”, all the Elementor styling were gone. Are there any ways to fix this problem since I also want to do some coding on the back-end as well. Thank you in advance. Don’t click back to WordPress. Why would you need to do that? Does this product, or will it, have a simple process to add a table with rows/columns. I need to keep a calendar of events, with easy ability for editors to add new events to top row? Perhaps each event could be a category of blog post with only the newest 5 or so events listed. (Older event posts would continue to exist in archive, and new events automatically listed in the table?) Many thanks. And BTW, this product looks amazing. Can you auto-save with Ajax or something similar? Kind of 1995 to have to constantly press save button. Or have a temporary file that saves changes and can be recovered in case of accidentally leaving a page while editing. Can Elementor have a totally blank theme and then users can start from scratch? Seems like WP wants users to get a theme first. So can Elementor 2.x just provide a “Blank Theme” that users can then truly build a website from scratch? Just started using Elementor 2.0 and love it! However, I’m having difficulty with something that seems like it should be really easy to do. I’m trying to place two elements side by side (horizontally) in a column and can’t seem to do it. Perhaps I’m just new to elementor and am missing something simple. Either way, how can this be done? Steven, after you’re done in WP editor, go back to “Edit in Elementor” for the post/page and click Publish (or Save Draft). That has fixed the problem for me. Thanks very much, …just relieved my frustration. Is it possible to use single template for normal static pages – so that we would set up a structure for static pages also? for example 3 column layout etc – same for all static pages? Has the full integration with ACF Pro been implemented yet (Repeater fields)? How about Pods integration? Coming from BB i want to nail down CPT /Dynamic content integration for new projects. What level of ADA compliance does this offer? It’s great that you have integration for ACF and Toolset. Would you mind consider creating an integration for Meta Box? It’s a popular plugin for creating custom fields in WordPress with more than 300000 active installs. I’m happy to collaborate on that. I simply love using Elementor! It has made working with WordPress a pleasure and I can get back to what I do best…Design! I’ve only just started building my site, but I really like the ease and functionality. Great job guys! Looking forward to what you bring us next. fghafoor, Do you have a link to a tutorial how to set-up a directory site with Elementor? Mas ainda assim eu preciso instalar um tema no WordPress? Congratulations. Keep your hardwork guys. I love your work ? Thanks for building Elementor guys! It saves a lot of time and all the grunt work. I appreciate it. thank you for your awesome plugin! It’s really the best one! Congrats for the excellent work!! Thanks a lot, this is very useful! I’m pretty happy with the Hello Them so far, the only issue I have with it though, is this h1 abomination (SEO wise). Reusing the Title for in the h1 is at best shooting yourself in the leg against competitors using the h1 properly. And things are even worse for the people who think that using display:none will hide it from the eyes of Google (which is wrong of course). So they’ll add a second h1 in the editor which is not good (yeah I know google said the opposite but my extensive field tests prove otherwise). Any plans on solving this issue (read : remove the hard coded h1 from the empty (but titled) page, so that the one which shows up in the DOM is the one you put in the editor? Thanks, other than that SEO issue, Elementor is excellent. Hi, please check the relevant branch on Github. Please I NEED an answer to steven’s question above. How does one recover from “back to wordpress editor ” !!! thanks for article . how to integration elementor with wordpress theme ? Is it possible to create a theme by myself or do I have to choose a theme to customize it? If so, how do I remove the name of the theme at the bottom of the site? You need to have a template in order to work with WordPress. As for the second part of your question, this changes from theme to theme so you will have to contact your theme’s support. There is no “Site tagline” widget in Elementor. There is a mistake in the article. May i customixe this theme for diffrent website,lik buy once and use on many website. I’m not sure I understand your question. You can find more info about the Theme Builder here. If you need further assistance, don’t hesitate to contact our support. How can you say this a “Theme Builder”. This should be called theme customizer not builder. Elementor doesn’t save the design in php files. We can’t export the designed websites as a full featured Installable theme just like any other theme.